Photos are snapped through both front-facing and rear-facing cameras whenever tracking is enabled via your account at GadgetTrak’s Web site and the app is launched. As GadgetTrak explained to me in a briefing at Macworld 2011, the company now sends a push notification which, if opened, launches the app and takes the picture. If the phone is on a network, the picture is then transmitted. While a thief might seem to have to be stupid to open a push notification, it’s second nature for some people to tap, and the message tries to entice them. Further, GadgetTrak noted that if the phone is locked and the push notification comes through, swiping to unlock the phone will launch the app and take the pictures. Photos are sent via email along with other tracking information. Every app that uses background features registers with iOS when it is installed, not just when it launches. The iOS background location manager then sends events to these apps, even if the foreground part isn’t running. It’s the equivalent of an extension to the system without all the ugliness that used to entail in old versions of Mac OS. The new features make it much more likely that a stolen phone will reveal details useful to law enforcement in tracking down the phone, and charging a ne’er-do-well. If only Apple had installed GadgetTrak on the leaked iPhone 4 prototype! A bit off-topic: perhaps the background processing described here explains the terrible battery life some of us have since upgrading to iOS 4? My iPod touch battery drains substantially in 8 hours overnight at home unless I shut WiFi off so I'm not on my home WiFi network. No problem in 8 hours at work with WiFi on, because I can't join that WiFi network. I've got Notifications, Bluetooth, Location Services, and Find My iPod, and probably some other things I've forgotten about, turned off, so they're not the cause. I've concluded that an app is causing WiFi use in the background when the iPod is on a WiFi network, and that WiFi use is what's draining the battery. I have a friend who was disappointed with his iPhone 4 battery life, and found that Airplane Mode when he didn't need network access took care of the problem. I have no 3G experience, but I wonder if this couldn't also explain the phantom AT&T data use that's the subject of this week's class action lawsuit. You should disable Location Services (since there's a full kill switch) on a normal day with a full charge in the morning. GadgetTrak doesn't burn the battery unless tracking is enabled. Which is nifty, as it can remain active as a background location app even with tracking turned off. Nice trick. I've run with tracking enabled all day, and my battery runs considerably through. With tracking off, since I don't use the iPhone 4 for many phone calls, I have most of the charge left at night. Sorry, I was apparently unclear in my comment. 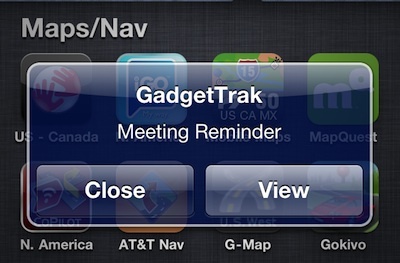 I'm not concerned with GadgetTrak, which I have not used. I'm interested to learn, from your article on GadgetTrak, that even non-running applications can still consume iOS resources in unexpectd ways. With the advent of iOS 4 and background services, apps can now do things in the background that the user is unaware of and often cannot direclty control, with consequences like network use and lower battery life. That this extends beyond background apps to non-running apps is a further surprise. The only sure control we have is to power down, which isn't the best approach to using an iOS device. That GadgetTrak's explanation that background services could still act on behalf of a non-running application was news even to you suggests that the implications of "multitasking" in iOS 4 have not been explained well to iOS users. They do not consume resources: they have registered with the Push services. The Push notification takes a form devised by the app creator, and only when you accept to view the notification does the app become active. It is Push itself that takes most of the battery juice. One other thing: when having Push notifications on, you have a semi-permanent data connection. If you have weak signal, your phone will emit with more power, and this will drain your battery faster.